Exchange Servers are the secure virtual postbox enabling you to communicate through emails. Alike other file formats, Exchange Servers have their own EDB file format storing data. This format simply maintains the data of the user that user has shared with the client at the other side. It can be email items and other items related to it. The EDB files are secure and reliable to hold the data; moreover, they can be accessed at any time and from anywhere as per user’s convince. However, one cannot deny occurrence of corruption. The only difference, when compared to other states of corruption, is that the occupancy of corruption level is quite elevated here due to numerous factors of corruption like JET errors, Exchange error message, registry error and dirty system shutdown. The most notorious factor of EDB file corruption is – Dirty System Shutdown. Figure 1 Instance of EDB corruption message. Figure 2 Another instance of EDB corruption message. The appearance of such messages alerts user that EDB files are on the brink of corruption. Thus, rescuing EDB files to safe house becomes an immediate concern of the user. However, looking for the reasons that lead to dirty system shutdown is of prime importance. 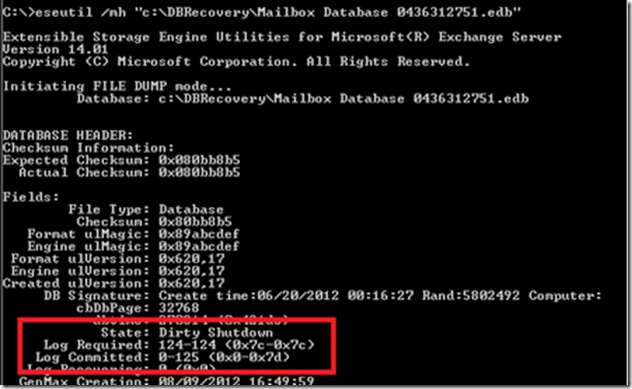 To retrace the genealogy of dirty system shutdown you must have knowledge of true working of Exchange Server. To channelize the required information it is necessary that such information must be attached to the database. Once the information is processed, its entry is made through log files. Thus, it is clear that log files keep the record of the input and output of the information transactions or simply transaction logs. The log files are of utmost importance as they are the source that let us know whether the concerned files need older version of the database or not. This is important because sometimes user deletes the required files and to reopen it again the same version of the database is needed. As the user encounters Dirty Shutdown of Exchange Server, it is quite obvious that the concerned data stored in EDB files are no more accessible and an immediate action must be taken to revive those files. To do so, you must take assistance from a reliable third-party Exchange Server Recovery software like Recoveryfix for Exchange Server. Recoveryfix for Exchange Server has been designed to rescue the contents like emails, contacts, calendar items, tasks, notes, journals, etc. from damaged EDB files. The entire process is perfectly accomplished without any delay. To have a quick glance over the items that were successfully recovered from damaged EDB files, Recoveryfix for Exchange Server provides ‘Preview’ option. The tool maintains data integrity throughout the process. This means that during the entire process, Recoveryfix for Exchange Server retains the EDB files structure and hierarchy. 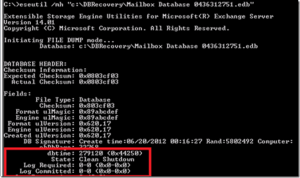 How Recoveryfix for Exchange Server fixes Dirty Shutdown Damaged Data? Recoveryfix for Exchange Server has inbuilt three recovery modes, namely: Automatic Analyze and Recover, Advance Scan and Rebuild Corrupt Databases. The selection of modes entirely depends upon the severity of EDB file corruption. Automatic Analyze and Recover Mode: Being the quickest mode among three, Automatic Analyze and Recover Mode recover the damaged EDB files and convert them to PST. Advance Scan: It is a medium paced scanning mode, which ensures perfect recovery from severely corrupted EDB files. Rebuild Corrupt Databases: This mode simply rebuilds the corrupt EDB database effectively and such database can be easily synchronized with MS Exchange Server. It is quite surprising that EDB database, which sometimes thought to be beyond the state of recovery can be perfectly recovered with Recoveryfix for Exchange Server. It is due to powerful inbuilt algorithm that takes care of the entire process without looping out any data.